Many types of rice are cultivated over the world, but Indian dishes principally call for long grain rice. It's fine to chuck some rice in boiling water for 20 minutes, but we show you here how to get the most from long grain rice. Basmati and American rice are both long grained rice and either can be used for Indian cooking. Basmati is more fragrant compared to American rice. Normally, Basmati rice is more expensive. Wash and drain the rice four times in lots of water. This process will remove much of the starch on the surface of the rice. Removing the starch helps stop the individual grains of rice sticking to each other. Leave the rice in a bowl of water for 20 minutes. 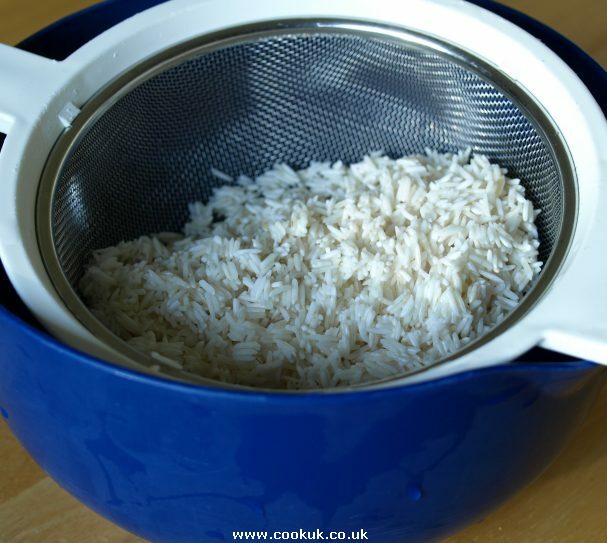 Pour the rice into a strainer, toss it a few times and leave it to drain for a few minutes. Add the rice to 800ml boiling water and salt in a covered pan on a medium high heat, stir occasionally. Immediately the water begins to boil (this will only take a couple of minutes) reduce the heat to very low. If you are using an electric hob and the heat cannot be lowered immediately then transfer the covered pan to another ring and which is on a very low heat. Cook the rice for 25 minutes stirring and checking it every 10 minutes. If the rice is sticking to the bottom of the pan, stir in three tablespoons of water. The idea behind cooking the rice on a very low heat with the pan covered, is to steam it rather than boil it. When the rice has finished cooking, remove it from the heat. Two tablespoons of vegetable or olive oil can be added and stirred in at this stage. It adds a gloss to the rice although it does not help separate the grains. Be aware though, the oil will colour the rice slightly yellow which is not ideal in many cases. 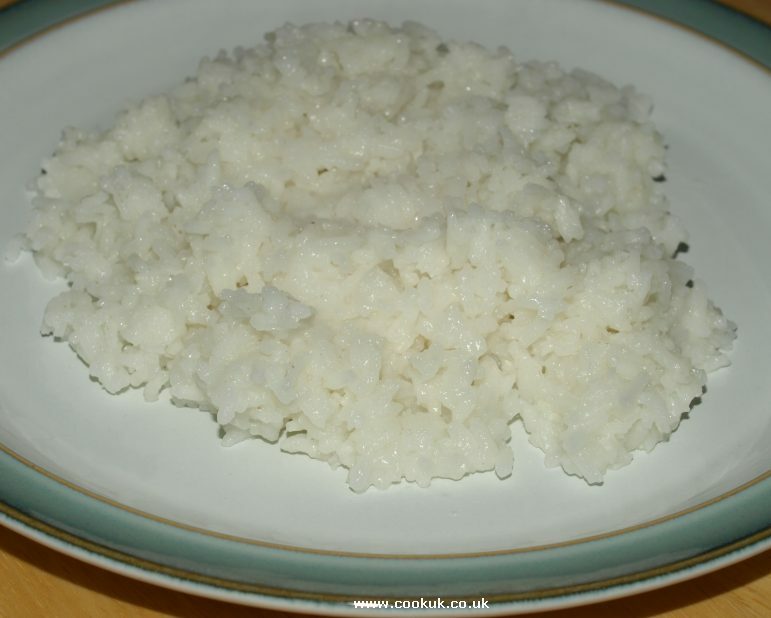 If you are concerned about timing a large meal then leave the uncooked rice soaking until you are 30 minutes away from needing the rice. Then start cooking it.